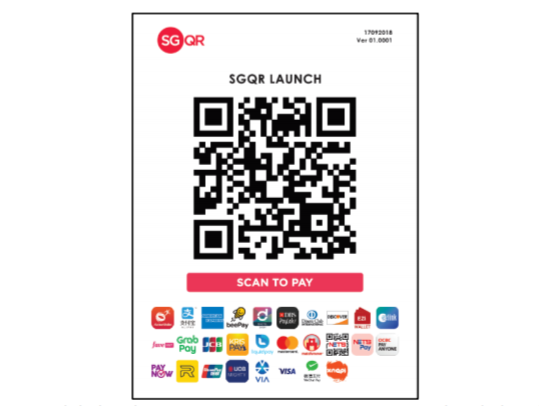 The Singapore Quick Response Code (SGQR) has been launched offering multiple payment QR codes into a single SGQR label. As reported last year, the Monetary Authority of Singapore (MAS) and Info-communications Media Development Authority (IMDA) unveiled a taskforce to develop this common QR code for the city-state. Members of the task force include both Singapore and international payments providers. With SGQR now up and running it will be adopted by 27 payment schemes including PayNow, NETS, GrabPay, Liquid Pay and Singtel DASH, and will be deployed progressively over the next six months. MAS says with SGQR consumers will be able to “quickly and easily see if their preferred QR payment option appears on the merchant’s SGQR label”. With the consolidation of QR codes, merchants will need to display a single SGQR label showing the e-payments it accepts. This means “less clutter on the store front and quicker payments processing”. MAS says SGQR does not require a terminal, so it is a “cheaper” way to accept various e-payment options. The first phase of SGQR label replacement, starting with merchants in the Central Business District, will start later this month. Plenty of big names are involved in SGQR. These include Alipay, American Express, Bank of China, DBS, Mastercard, United Overseas Bank, UnionPay, Visa and Tencent.